Arctic Heating & Air, Inc. is dedicated to the complete satisfaction of our Los Angeles area customers. Our existence is based upon the effectiveness in which we enhance the level of your indoor comfort control! So how do we do it? We start by offering the latest in air conditioning, heating and indoor air quality technologies, featuring York® products for top of the line efficiency and performance. With a reliable HVAC product foundation, we then really pay attention to your needs. Arctic Heating & Air, Inc. does not apply cookie cutter solutions across the board. Instead, our recommendations will be centered around the what is best for your specific air conditioning, heating and indoor air quality requirements. 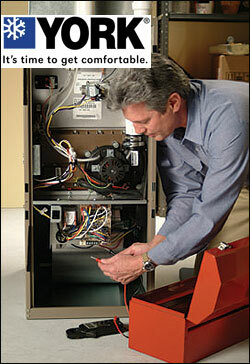 Lastly, we protect your heating and air conditioning investment with our preventative maintenance plans. From tune ups to seasonal preps to filter changes, Arctic Heating & Air, Inc. can help you enjoy efficient indoor comfort all year long! Thank you for your interest in the finest Los Angeles HVAC products and services. When you use us for your indoor comfort control needs you will not be disappointed! Why York® for your Los Angeles air conditioning, heating & indoor air quality needs? York® indoor comfort control products are built to be reliable and efficient. York air conditioners and furnaces hold some of the highest efficiency ratings in the industry, which means our customers can save substantially on their monthly utility bills. Additionally, York HVAC products incorporate innovative features like ClimaTrak and QuietDrive, making their furnaces and air conditioners some of the most adaptive and quiet HVAC units you can purchase for your home. As mentioned above, our professional installers have one primary goal: your complete satisfaction! With York® heating and cooling products, we sleep easy at night knowing that our Los Angeles area customers have the very best keeping them comfortable. It just doesn't get much more important than that.